My Lords, I, along with other noble Lords, was proud to be a member of a Government who devoted so much time and effort over a decade to help Northern Ireland move from the horror of its violent past towards a better future. The devolved institutions set up in 2007, after a settlement that I helped negotiate, have not functioned for the past 15 months, and there appears to be little prospect of a change in that position. I have heard nothing from the Government to suggest that they have a clue what to do. Former serving Ministers in Northern Ireland such as myself and my noble friends Lord Murphy of Torfaen, Lord Reid, Lord Mandelson, Lady Smith of Basildon, Lord Browne, Lord Rooker and Lord Dubs, feel passionately about the way that the enormous peace progress made has gone so badly into reverse. The measures in these Bills should never have had to come to us in the first place. They represent direct rule in all but name. But I do not think we can simply nod them through as a matter of process without addressing some of the implications of the current political impasse. The people of Northern Ireland are left in limbo, facing, as the noble Lord, Lord Empey, has pointed out so graphically, a serious crisis in the National Health Service, probably worse than in any other part of the UK. Last week I had the privilege to meet a group of remarkable people for whom that limbo is particularly cruel. They were members of the WAVE Trauma Centre’s injured group, and I will briefly recount two of their stories. Jennifer was 21 in 1972 when she and her sister, who was shopping for a wedding dress, went into a Belfast city centre cafe for a coffee. A no-warning IRA bomb tore both Jennifer’s legs off. Her sister lost both legs and an arm. Noble Lords from Northern Ireland will recall the horror of the Abercorn bomb. Peter was 26 when he was shot by a loyalist gang in 1979 in a case of mistaken identity. Because of the configuration of the flat where Peter lived, the ambulance crew could not manoeuvre a stretcher around the stairs. They brought Peter down in a body bag. His father Herbert arrived at the scene and thought that his son was dead. “Oh my poor Peter” were his last words. He had a heart attack and died as Peter was carried to the ambulance. Peter is paralysed and confined to a wheelchair. There are many more similarly harrowing stories. It is estimated that around 500 people in Northern Ireland are classified as severely physically injured as a direct result of the Troubles, with injuries that are at the very top of the scale: bilateral amputees, paraplegic, those blinded. All the injuries are life-changing and permanent. Because of their injuries most have been unable to work to build up occupational pensions and today have to survive on benefits. The levels of compensation paid through the adversarial criminal injuries compensation scheme were wholly inadequate and there was no disability discrimination legislation in the early days to protect them. Frankly, these people were not expected to live beyond a few years. But they have and the passage of time has compounded their problems as many suffer increasing physical distress as a result of deteriorating health and chronic pain. They are campaigning for a special pension of the type that is in place in most other countries that have suffered from conflicts similar to that in Northern Ireland. All they want is some semblance of financial security and independence as they grow into old age in the most difficult circumstances. I find their argument compelling. The pension has been costed by independent consultants at around only £3 million to £5 million per annum—a figure which will reduce year on year as the majority of the severely injured are moving into old age. I appeal to the Government to provide this money now. It is a small amount to rectify a big injustice. All the Northern Ireland parties are on record as saying that they support the idea of a pension for severely injured people such as those who come to see them and argue their case. But saying they support it is about as far as it has gone because their support for ​the severely injured is not unconditional. Of the 500 severely injured, there are 10 or so who were injured by their own hand; for example, planting a bomb that exploded prematurely. Of the 10, six are loyalist and four republican. It is no surprise that the DUP and Sinn Féin are split. The DUP says there can be no pension for those injured by their own hand. Sinn Féin insists that they cannot support a pension that excludes them as this would be tantamount to accepting a hierarchy of victims. The injured group, who are unfairly drawn into this toxic debate, argue that it is not for them to say who should or should not qualify. What they do insist is that it is unjust, unfair and immoral for politicians to say that because they cannot agree about 10 people the other 490 must get nothing. I totally agree with them, and I hope the Minister will respond positively. The injured group, all of whom have been injured through no fault of their own, regard their plight as being as much a part of the legacy of Northern Ireland’s violent past as anything else, and the legacy issues are not devolved entirely. But the Government refuse to accept that they are part of the legacy for which they have responsibility. If the devolved institutions are, for whatever reason, unable to deliver on this—and of course, suspended, they are unable to deliver on this; and tragically, we are unlikely to see those institutions in place for some considerable time—the Government at Westminster surely must step in now, because it would be shameful if the people who have suffered so much through no fault of their own were told that nothing can be done because of political buck-passing. I agree, and I appeal to her and to the Minister to act now. They have the power to do so. It is a very small amount; it would not be noticed on the overall allocation for Northern Ireland or, indeed, the Whitehall budget. It would not be noticed at all. I have met men and women in the WAVE trauma group who by any definition have “suffered most”, in the Secretary of State’s phrase. Unless both this Parliament and the Government accept that responsibility and act immediately to provide pensions for these 490 people, it will be to our eternal shame. My noble friend Lord Browne of Ladyton will also address this specifically on Amendment 215, an important amendment that he has tabled with the support of other noble Lords—and noble Baronesses. We scarcely need to remind ourselves that the Good Friday agreement, which my noble friend Lord Murphy of Torfaen negotiated, was a triumph of politics over violence in post-conflict Northern Ireland. When I spoke in this place over a year ago, I said that a hard Brexit and the hard border that would inevitably follow it would test the delicate balance of the three strands of the Good Friday agreement—relationships within Northern Ireland, between Belfast and Dublin and between London and Dublin—on which the peace settlement is based. That, sadly, is coming to pass. The Good Friday agreement was a good-faith effort to take the toxin out of identity politics in Northern Ireland, where those who identified themselves as Irish could live with those who identified themselves as British and with those who see themselves as Northern Irish. There is no doubt that since Brexit, which the ​majority of people in Northern Ireland voted against, the divisive politics of identity is coming increasingly to the fore again. That is profoundly disturbing. Meanwhile, there has not been a local Administration for over a year—an equally profound government failure. Relations north and south are also deteriorating, to the extent that a senior member of the party propping up the Government can publicly call the Taoiseach a “nutcase”, and “not Indian” but a cowboy. To get the full flavour of that particular witticism, noble Lords need to know that Leo Varadkar’s father was born in Mumbai. The tensions between the UK leaving the EU and Ireland remaining in it are clear. Following the phase 1 joint report on Article 50 on 8 December, the EU produced a 120-page document setting out the legal framework for fallback positions in the absence of agreement between the UK and the EU on the way forward. There were howls of protest and the Prime Minister rejected it out of hand, but where is the Government’s legal framework setting out what they think they signed up to on 8 December? Presumably, it sits alongside the Brexit Secretary’s impact assessments. We are still desperately unprepared for Brexit and this is no more evident than on Northern Ireland. The UK Government, having agreed with the EU three months ago in the phase 1 agreement to maintain a frictionless border to preserve the Good Friday agreement, continue to fail completely to demonstrate how they can combine an open Irish border with the UK remaining outside both the single market and the customs union with the European Union. There is a simple reason for that—they cannot. Yet in her desperate attempt to keep her Cabinet—never mind her party—together, the Prime Minister continues to spin platitudes and delusion. Just last week, she was still maintaining that the United States/Canada border could be a model for an open border in Ireland. This is just nonsense. There are armed guards patrolling that border; there are flags on it; there is infrastructure on it—all the things that were specifically promised would not be on the border between Northern Ireland and the Irish Republic. If they were, they would be recruiting sergeants for mayhem, civil disobedience and attack. Ministers still maintain the fiction that technology is the answer. All technological solutions require resources, infrastructure and preparation to implement. They do not substitute for the need for checks and inspections but merely aid the efficiency in crossing the border legitimately and identifying potential breaches of compliance or false declarations. As the former Permanent Secretary at the Department for International Trade, Martin Donnelly, has made clear, on the Northern Ireland border there is absolutely no evidence, and no serious expert in the customs field, who thinks that there can be an invisible technological border. He said that it does not exist anywhere in the world. I am most interested but I wonder whether the noble Lord has looked at the evidence given to the Select Committee on Exiting the European Union in the House of Commons by the head of Customs and Excise, who said that whatever the outcome of the talks, there would be no need for infrastructure on the Irish border. I know that evidence has been given but I simply stick to what I have argued, supported by the former Permanent Secretary at the Department for International Trade, who is an authority on these matters. “Government departments’ poor track record of delivering critical border programmes, such as e-borders, leaves us sceptical that they are up to the challenges of planning for the border post-Brexit”. The Foreign Secretary compares it all to the congestion charge between council areas in London. Sadly, he knows little about the issues and cares even less. The single market and customs union are not political deals but rules-based legal entities. As an EU member state, the UK has rightly insisted on the strict and consistent enforcement of these rules. Brexiteers, no doubt including the noble Lord, Lord Lamont, pretend that the EU can pick and choose to satisfy the UK that we can have all the benefits of being in the customs union and single market with none of the obligations, and that we can have an open Irish border while rejecting all the rules for keeping it open. That is like saying, “I want my country to play in the World Cup but I won’t recognise the offside rule”. “special interest in Northern Ireland and … the extent to which issues of mutual concern arise in relation to Northern Ireland”. The agreement expressed the British Government’s wish to “develop still further” close co-operation with Ireland. Strands 2 and 3 of the 1998 agreement, the cross-border and British-Irish strands, are international by nature and their future cannot be determined solely by the will of this Parliament. The British Government are legally bound, in partnership with the Irish Government, to ensure that the functions and objectives of this co-operation are unimpeded by withdrawal from the European Union. So the Government appear to have committed themselves to bringing forward amendments, I assume on Report, to enshrine their obligation to observe the Good Friday agreement. If that is the case, as my noble friend has reminded us, then the Government should be supporting this amendment and putting it into statute. During the referendum campaign in 2016 two former Prime Ministers, Sir John Major and Tony Blair, both of whom made significant contributions to the peace process, gave speeches in Derry/Londonderry, in which they stressed that imposing a hard border between the north and the south of the island of Ireland would threaten the very basis of the peace process and the stability that the island of Ireland has enjoyed. Both have cogently reinforced their case in recent weeks and are as alarmed as any of us privileged to have served as Ministers in Northern Ireland. There are more crossing points along this 310-mile border than there are along the whole of the EU’s eastern frontier: 257 compared with 137. The border crosses family farms and separates towns and villages from their natural hinterlands. It is both invisible and ever present, both unremarkable and deeply contested. Even the younger generation on both sides of the border associates the very idea of border controls with conflict and collective trauma. As well as the formal movement of goods, there are many services from cross-border medical and pharmaceutical transactions to people and data movements between supply chains north and south and the infrastructure issues: energy, telecoms, air and rail travel, environmental standards and so on. If, as the Prime Minister insists, Brexit means the UK leaving the customs union and the single market—a rules-based legal entity, not just a political agreement—then Brexit would unavoidably mean the introduction of a hard Irish border. Is my noble friend aware that the European Parliament has today voted by 554 votes to 110 for a framework agreement that supports seeking UK associate status but that the necessary frictionless trade can be guaranteed only by membership of both the customs union and the single market? That underlines the point he is making. I understood that this was a proposal being put by, I think, the leader of the European Parliament, Guy Verhofstadt. I am grateful that my noble friend has brought it to the attention of the Committee. A hard border is one that consists of layers of barriers to movement—that is, tariffs, quotas, bans and regulations—and requires strict conditions and evidence of compliance to cross: declarations, inspections, authorisations, visas and permits. However, while harder borders require greater means of control and management by states, it is not the visibility of a border that determines how hard it is. The experience of a harder border is felt away from the border line in the obstacles faced by an individual or business when seeking to cross it legally to work, trade or operate on the other ​side. Hard border arrangements therefore threaten the evolution of a successful all-island economy, which is essential to the economic development and long-term prosperity of Northern Ireland. A combination of the conditions of EU membership and the operation of the 1998 agreement has enabled cross-border economies of scale, supply chains, public service delivery and practical co-operation to flourish. These are particularly essential in areas, such as those in the central border region, which have suffered the consequences of multiple deprivation and conflict. It is estimated that 30,000 people commute across the border every day. Around 1 million HGVs, more than 1 million vans and 12 million cars move between Northern Ireland and the Republic every year. Northern Ireland is also a vital route to market for goods from the Republic, with the UK acting as a land bridge to markets in the EU 27—some of the goods going through Wales, I might add. Approximately 40% of container movements to or from the island of Ireland go through Northern Ireland. Also threatened are 142 areas of north-south co-operation that have developed as a result of the implementation of the 1998 agreement. These range from an all-island regime for animal health and welfare to shared infrastructure and emergency healthcare planning and provision. They bring direct benefits to people on both sides of the border, and much of this co-operation relies on regulatory alignment across it. For example, Dublin Airport is the main entry and exit point for air travel for Northern Ireland, around half of whose residents use it for holiday travel. Brexit will also require a new aviation agreement between the UK and EU member states if there is not to be disruption to flights to and from Ireland to the UK. “The Single Electricity Market (SEM) on the island of Ireland has been a key dividend of the peace process, reducing energy prices in both Northern Ireland and the Republic of Ireland, and helping to achieve decarbonisation targets. It is therefore vital that the SEM is able to continue post-Brexit. Given that its functioning requires the implementation of EU energy laws in Northern Ireland, the mechanics of maintaining the SEM will require careful consideration and new arrangements, particularly if the UK were to leave the Internal Energy Market”. Food and agribusiness, worth more than £4.5 billion, form the largest cross-border trading sector, relying hugely on EU membership for everything from farmer payments to tariff-free exports. The sector operates on a de facto all-island basis. Examples include the 594 million litres of milk that are imported from Northern Ireland for processing in Ireland. If import tariffs or even non-tariff barriers were put in place, that could decimate the Irish milk-processing sector. Nearly all the wheat grown in Ireland is sent north for milling and then re-imported back to Ireland. Nearly 40% of Northern Irish lamb is processed in the Republic, while a significant volume of pigs and cattle from the south are processed in Northern Ireland. The Bushmills distillery, the oldest ​working brewery in Northern Ireland, which claims to have invented single malt before the Scots and is located on the beautiful coast of County Antrim, has trucks making 13,000 border crossings each year. I welcome the noble Lord, Lord Duncan, to his post as a Minister and commend the empathy he has shown in responding to the debate, which I think the whole House welcomes. I will not respond to the whole debate—the hour is too late—except to commend the marvellous, passionate eloquence of the noble and right reverend Lord, Lord Eames. He would be able to get me to follow him on any theological journey, which is asking a lot of me. However, I regret that the Minister has not really responded to the questions put to him. For example, the Brexit Secretary said recently that there would be no problem monitoring imports and exports between Northern Ireland and Ireland after Brexit and there would be no need for a hard border because we already do this for VAT purposes. But we can do it for VAT purposes now only because we are in the European Union’s VAT Information Exchange System—VIES. Outside the EU, we are out of that tracking system. Then, on Sunday, the Chancellor admitted that there was not an example in the world of the kind of technological open border alluded to by the Minister. Who believes for a minute that it can be done, apart from the Foreign Secretary—who thinks that South Armagh and Louth are the same as Camden and Westminster, except with more Guinness? The Prime Minister insists that Brexit means the UK leaving the single market and the customs union, which I do not accept for a moment. We can Brexit and stay in the single market and the customs union; other countries are outside the European Union but are in either the customs union or the single market. But if she were right, the UK Government in turn would be obliged by WTO rules to enforce hard border arrangements on the island of Ireland because of the change in their relationship with the EU. Therefore, to keep the border open as it is today, there is no alternative ​to Northern Ireland—and, by implication, the UK—remaining in both the single market and the customs union. I regret that the Minister, despite his empathy, has not really answered that point. I will not press my amendment. My Lords, having added my name to the amendments in the name of my noble friend Lord Adonis, I want to explain that they are designed to give back to Parliament control of when the European Communities Act 1972 is repealed and to strengthen the effect of the amended Clause 9(1), which was designed to give Parliament a meaningful vote on the final terms of withdrawal and which required that a new statute be put in place before any regulations are made to implement the withdrawal agreement. I do not need to remind your Lordships’ House that what is at stake is more than a matter of process or procedure. It is ultimately about whether either Parliament or a group of hard Brexiteers who are trying to manipulate the Government will decide the future of the people of this country. What is at stake is people’s jobs and standards of living, which depend on our trading relationships; the protection of labour rights and environmental standards; the alliances on which Britain’s future security depends; and the future of the Good Friday agreement, which has brought peace and stability to the island of Ireland for generations to come but is itself now under attack from assorted Brextremists—including, astonishingly and recklessly, a former Secretary of State, Owen Paterson, who should know a great deal better. It is reckless and downright dangerous to put Brexit dogma before peace and stability on the island of Ireland. “from the date of entry into force of the withdrawal agreement or, failing that, two years after the notification referred to in paragraph 2, unless the European Council, in agreement with the Member State concerned, unanimously decides to extend this period”. Therefore, Article 50 in its entirety means something quite contrary to the widespread impression, often reinforced by Ministers, that there can be no flexibility ​about exit day. As the noble Lord, Lord Kerr, the author of Article 50, has made it clear, the article contains provision for a possible extension of the period if that is needed to come to an agreement. The main purpose of our amendments is therefore to give Parliament rather than Ministers the power to control the UK’s position on the date of exit day. By specifying that the European Communities Act 1972 can be repealed only on a date to be determined either by a further Act of Parliament or in the Act of Parliament enacted for the purposes of Clause 9(1), Amendments 2 and 3 support the amended Clause 9(1) by ensuring that Parliament stays in control of the timing of exit day under Article 50, and is thereby in a position to influence the withdrawal agreement and its provisions for the framework of the future relationship between the UK and the EU. Our amendments are of particular importance in view of the earlier government amendments to Clause 14, moved on the final day in Committee in the other place, which gave Ministers power to fix the date of exit day. In their initial draft of the Bill, the Government were apparently satisfied that, for the purposes of the Bill, the date of exit day could be left to Parliament. Then, for what appear to be purely internal party factional reasons, the Government introduced an amendment to fix exit day in the Bill for 29 March 2019 at 11 pm for all purposes. 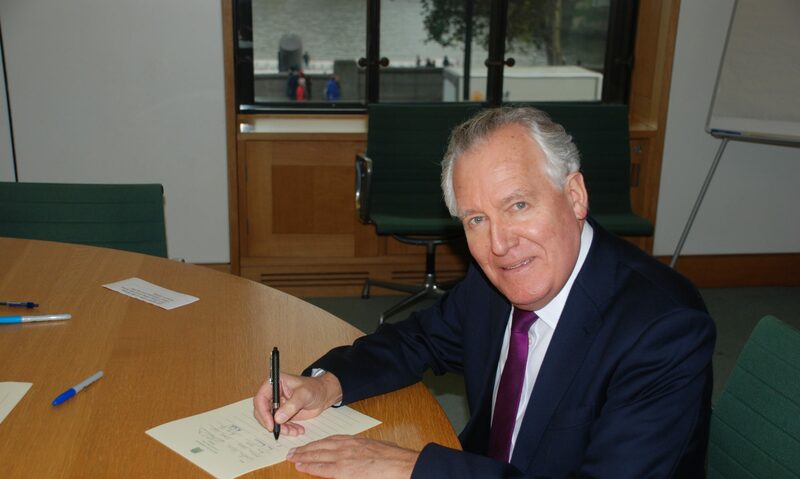 The Government also supported amendments by Oliver Letwin which allowed the date to be changed by Ministers if the withdrawal agreement provides that the UK will leave on a date different from that set out in Clause 14. I trust that your Lordships’ House will agree that Parliament rather than Ministers should be in control of the process. However, the government-supported amendments in the other place allow the date to be changed only by Ministers, not by Parliament, even if Parliament has a different view to that of the Executive. In addition, this could happen only if an alternative date on which the treaties ceased to apply to the UK was included in the withdrawal agreement—that is, only if Ministers agreed an alternative date with the EU. Under the Bill, Ministers would in these circumstances therefore be able to use secondary legislation to change the date in UK legislation as well, thereby bypassing Parliament. Surely, that is completely unacceptable on a matter of such crucial historical importance. Therefore, there are a number of important and worrying implications of the government and government-supported amendments approved in the other place, which can be overcome by the amendments that my noble friend Lord Adonis has tabled, giving Parliament control over the date when the European Communities Act 1972 can be repealed, thus forcing the Government, if necessary, to go back into the negotiations with the EU under Article 50(2). if negotiations were deemed to have failed, the date of exit could be made earlier than 29 March 2019, thereby pre-empting Parliament’s consideration and implementation of a statute approving exit. As things stand, if there is no withdrawal deal, Parliament will be bypassed without any right to a vote. The Government’s amendments relating to the date of exit day have therefore been seen by some as potentially paving the way for a pre-emptive no deal—a so-called “hard Brexit”—by hard-line Brexiteers. Another potential outcome of leaving the power to change the date of exit day in the hands of Ministers only is that this could be used by them to fail to pursue issues where Parliament wishes to see progress in the negotiations, on the grounds that they do not need Parliament’s support for Brexit in order for them to proceed on the pre-determined date. By the time any such vote comes on the withdrawal agreement, perhaps as soon as the end of this year, it could be difficult, if not impossible, to make substantive changes to the outcome. Neither the EU Commission, nor the member states, will be keen to renegotiate it. The European Parliament has its own agenda, and it seems highly likely that the choice facing the UK Parliament, as a result of Theresa May’s premature triggering of Article 50, would in these circumstances be to either accept the terms or reject them, with no leverage to force the Government back into renegotiations, so risking precipitating the UK crashing out of the EU with no deal. Surely, it is incumbent upon both Houses of Parliament to prevent this scenario by ensuring that Ministers are obliged to refer back to Parliament during the negotiations to ensure they win the ensuing vote. Another danger is that the transition period, which the Prime Minister has inappropriately referred to as the implementation period, and which Labour, with the support of the CBI and the TUC, has advocated, could be at risk in the negotiations if Ministers alone control of the date of exit day. This transition period is necessary to prevent a so-called “cliff edge”, involving a legal and regulatory void, with chaos resulting for our businesses and services and gridlock at our borders after exit day. A transition period covering as many years as necessary would also ensure that exporters would not have to adapt to two new customs and regulatory arrangements in succession by first dropping out of the EU framework and falling back on the totally inadequate WTO rules and then later, possibly much later, becoming part of arrangements negotiated as part of a comprehensive trade deal with the 27 countries of the EU, which currently take almost half of our exports. In addition, even if a transition period is agreed, the UK will drop out of the over 60 trade deals with “third countries” which we have access to through our membership of the EU. However, it appears that the Government’s concept of “on current terms” in the ​transition period excludes the European Court of Justice from its role in arbitrating commercial and other disputes. This is one effect of those government amendments relating to exit day, which would potentially end the jurisdiction of the ECJ on 29 March 2019, thereby preventing agreement on a transitional period “on current terms”. The UK also apparently wants to object to the application of new EU laws and to treat European citizens who come to this country differently during the transition period. All this makes it less likely that a transition period will be agreed in detail at the next EU summit, just weeks away on 22 March, in which case discussions will not move on to a framework for the future relationship. There are, therefore, now fears that the talks on the next phase, the post-transition end state, including the outline of a future trade deal, will have to be delayed, casting the whole timetable into doubt. The more things are delayed, the greater the danger that the EU will simply impose a very narrowly drawn trade deal on the UK or, worse still, the UK might crash out without a deal, to the evident glee of Brextremists such as Jacob Rees-Mogg. Many people have imagined that the text of Article 50(2) of the Treaty on European Union—and I speak with some trepidation, given that its author, the noble Lord, Lord Kerr, sits opposite me—implies that any withdrawal agreement will constitute a new trade deal with the EU. It does not. However, anyone familiar with major trade deals knows that they reflect the judgment by states of what will be in their own interests and the relative economic power and weight of the parties involved, and that they take years to negotiate. That is presumably why the noble Lord, Lord Bridges of Headley, a former and very recent Minister for Exiting the European Union, said that he did not believe that it would be possible to sort out the divorce bill, the implementation period and the final deal on our withdrawal within the timeframe envisaged. It is therefore completely unrealistic to imagine that the detail of a new trade agreement with the EU will be finalised before the specified exit day or even before the end of the transition period, assuming one is agreed, which, for reasons relating to its budget period, is currently being set by the EU for the end of 2020.
with little flesh on the bones, which may therefore fall very short of the guarantees which I believe that a majority both Houses of Parliament wish to see: namely, access in the future to EU markets equivalent to what the UK has now to prevent a “cliff edge” for businesses and services and to protect the hard-won benefits of the Good Friday agreement and a completely open border on the island of Ireland. The Irish question is a crucial reason for Parliament being in charge of the exit date. The serious near-breakdown in the December negotiations between the UK and the EU was eventually resolved only through ​both sides pledging no regulatory divergence between the Irish Republic and the UK. However, although this cleared the way for the next phase of the Brexit talks, the task of giving it legal effect in the withdrawal agreement remains. Brussels has asked for “precise, clear and unambiguous” proposals to avoid reimposing a hard border between the Republic and Northern Ireland, linking this to progress on transition. Brussels and most dogma-free analysts interpret this December agreement to require the whole of the UK to remain in the single market and customs union, or its exact arrangements, if there is not to be “regulatory divergence” between the Irish Republic and the rest of the UK. Yet the Prime Minister has dogmatically excluded that. It is in everyone’s interest, surely, including the DUP’s, that the exit date is not set in concrete, as it is in this Bill, giving sufficient time both to find a solution on the Irish border and, as the CBI and the TUC have argued, the economy. Parliament should not be asked passively to sanction a transition to an unknown destination by Ministers—what could be a suicidal leap into a chasm of chaos and uncertainty. We surely have a duty to ensure that, if no deal is struck, or the terms of such a deal are deemed inadequate by Parliament, the provisions of the European Communities Act 1972 continue in force and the timing of exit day will be delayed in order that these critical issues for the nation’s future are properly addressed. The purpose of Amendments 2 and 3 is that, on the precise date of Brexit, Parliament—not Ministers—should have the final say on our country’s destiny and on whether any deal either preserves or threatens peace and stability on the island of Ireland.